If one observes ones own span of life, one would realise that one has transformed from birth to childhood; from childhood to boyhood; from boyhood to manhood; from manhood to old age and after old age there is death waiting for us. In one sense, one is reincarnating from birth to childhood and then to boyhood, etc. So although one is experiencing a gradual change of the body, yet one is feeling that they are the same individual throughout the passage of ones life. Ones relatives are still identifying with that same person throughout ones life. Hence, even though the body is changing drastically ones identity remains with the same individual throughout this inevitable change. This individuality remains even when one after quitting the present body gets their next material body. In the same scriptures it is stated that there are 8,400,000 species of life. So an individual soul passes through all of these species and finally comes to the human platform to realise its original spiritual identity which one cannot comprehend in other species of life. Lower species do not question life, they just get on with it and simply eat, sleep, mate and defend. Only the humans question, challenge and transform their surroundings to suit their needs and comforts. The turning point comes when one enquires, ‘Athato brahma jigyasa?’, ‘What is the purpose of life? When one looks at the past family photo album one cannot help but admire the pictures of ones transformation from birth through youth to the present age. Similarly, one should admire the transformation of ones material existence from a one-celled Amoeba to the great human being one has become. Sometimes in our dreams we re-live details of experiences of our previous life like, flying or falling or being chased by some creatures or swimming just like a fish. It makes us wonder how come in our dreams we know so many vivid details of such amazing experiences. Reincarnation is a possible answer. There are individuals who have realised and verbally shared their previous existence via the past life regression techniques. They have shared these experiences on live television to prove the existence of reincarnation. 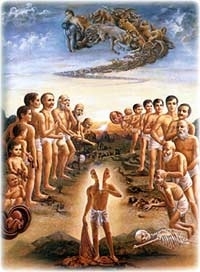 It is a fact that more and more people are accepting the reincarnation presented in the Vedic scriptures. In the scriptures it is revealed that whatever one desires and deserves at the time of death that is what one gets as the next body to enjoy or suffer. during ones period of awake which will bring change to ones intellect i.e. via knowledge and not otherwise i.e. via deep sleep. Similarly, if ones mindset and actions remain the same in their present span of life, ones next body will also be similar to the existing one. Death cannot upgrade their intelligence if nothing was done about it during their life. In contrast, if with the influence of spiritual knowledge and devotional process one changes ones actions and mindset now, then in the future one will be awarded a better material body or even a spiritual body which will qualify one to enter the spiritual world. 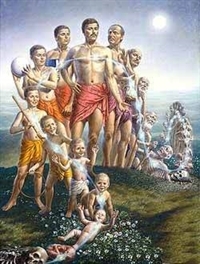 Now, that is the aim of reincarnation. If you don’t succeed at first you are, by the mercy of the Lord, given another chance to strike a relationship with Lord Krishna to change your situation and make the difference at the time of death, never to be born again in this material world which is temporary and full of misery. However, if one becomes Krishna Conscious in this life, it does not really matter whether one is in the material world or spiritual. One is under the protection of the Supreme Lord carrying on with devotional service to the all merciful Lord, Lord Krishna. So please reincarnate from material existence to a spiritual life of love for the Supreme Personality of Godhead, Shree Krishna.